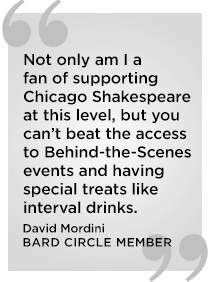 Join the Bard Circle—a vital giving society—and receive the ultimate Chicago Shakespeare experience! By making a leadership gift of $1,000 or more, you can directly support astonishing artistry and unlock the power of Shakespeare for thousands of students. And, you’ll be given VIP concierge service at the Theater, including complimentary interval drinks at every production you attend and exclusive events with the world’s leading artists. 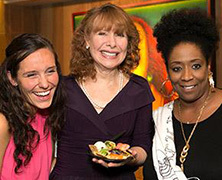 Bard Circle Partners at the $1,000 level enjoy VIP Ticketing, VIP Interval Service and Two Behind-the-Scenes Events with Artists. Additionally, Bard Circle Patrons at the $2,500 level receive an invitation to the Season Opening Night Celebration. Join our Bard Circle Fellows at the $5,000 level, and enjoy an invitation to Subscription Show Openings, Ticketing Services for Broadway and Regional Theaters. Bard Circle Ambassadors at the $10,000 level receive lobby recognition, invitations to WorldStage Series Productions, and access to CST Facilities for Personal Events. Members of our Shakespeare Society at the $25,000+ level, have the opportunity to Sponsor a Production and enjoy access to Exclusive Events with CST Leadership.